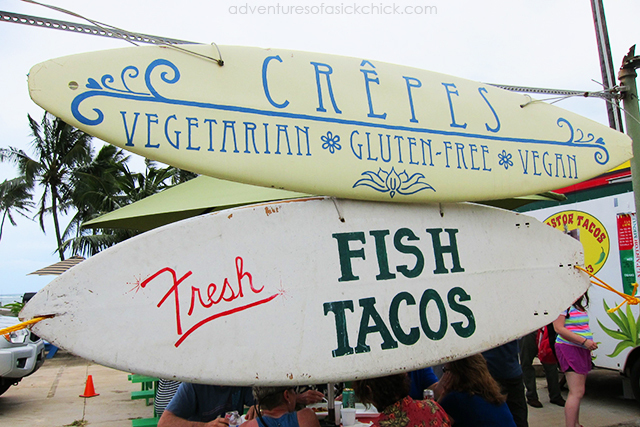 Although it’s often challenging to find gluten-free culinary options while traveling, our recent visit to Kauai was quite the opposite experience. 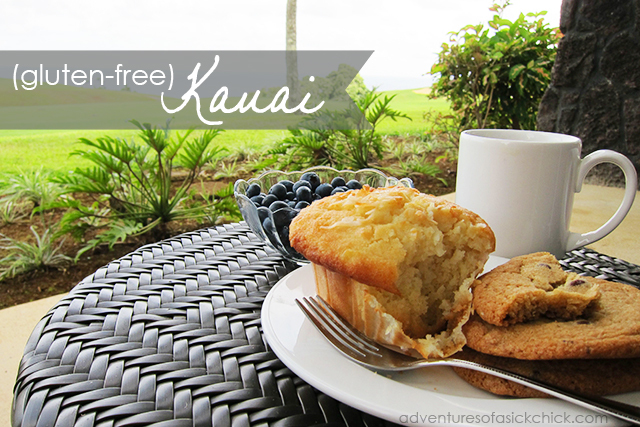 Not only is The Garden Island beautiful and lush, but Kauai is also about as gluten-free friendly as it gets! A good portion of the restaurants (if not the majority) identify gluten-free options on their menus, making it a breeze to follow a gluten-free diet while on vacation. (The island is also very vegan and vegetarian friendly, as these options are also often identified on most menus.) I almost felt like the island was rolling out the red carpet for me personally, as I’ve never visited a location that is so in tune with understanding and catering to food restrictions and health choices. And although gluten-free doesn’t automatically equate to Paleo, I find that it’s usually a good start. It seems that you can turn any corner on Kauai and find health-conscious menus. On top of being very gluten-free and vegan friendly, the island takes pride in providing organic, non-GMO local produce and ingredients, and often takes other additive-free measures. Most food options are fresh and locally grown/caught/raised, creating an experience that is as healthy as it is delectable. Seriously, could it get any better? Sweet Marie’s Hawaii (Lihue) – this restaurant and bakery was our first stop after we arrived on the island. Only five minutes from Lihue Airport, it was the perfect place to enjoy lunch and stock up on a few treats for our stay. Everything at Sweet Marie’s is gluten-free, and they also offer menu and bakery items that are free of soy and dairy (yes!). We had the turkey meatloaf (delicious) and cheese pizza (I couldn’t resist at least one slice) which came with veggies and brown rice, and fresh greens on the side (respectively). Their display of muffins and cookies (composed of mostly organic ingredients) were impossible to resist also, so we ended up picking up a few treats to enjoy during our stay. The muffin selection we sampled included Tropical (pineapple and coconut), Coffee Cake Streusel, Morning Glory and Banana Chocolate Chip, and we also had to try their chocolate chip cookies. They were all delicious, and you would never know they were lacking conventional wheat flour. 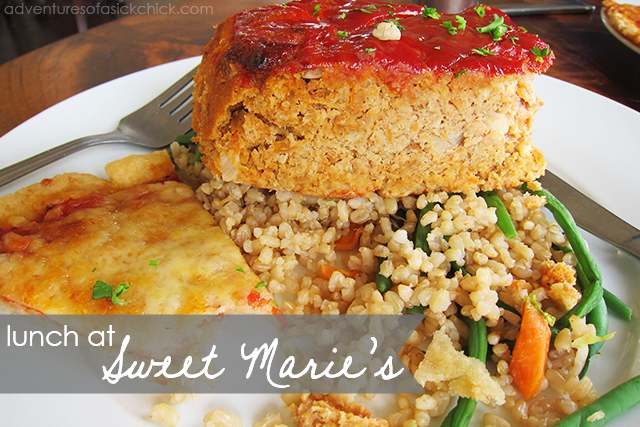 Sweet Marie’s is completely gluten-free, so Celiac folk can enjoy eating here without the worry of cross-contamination. It’s a must-try stop when you’re in the Lihue area. Postcards Cafe (Hanalei, North Shore) – self-described as “superb seafood and gourmet natural foods cuisine,” Postcards was also a must-try stop on our itinerary. The restaurant boasts using mostly organic ingredients and locally grown produce on a menu that emphasizes vegan food (with the exception of seafood). Their menu is also free of refined sugar and chemical additives, and has a number of mouthwatering gluten-free options. Many dishes are customizable: I had the Thai Coconut Rice Noodles with Kauai Shrimp Broth (and I added shrimp to the dish for protein). I expected more of a soupy broth, but the dish is really more of a noodle dish tossed in a (very) spicy sauce (the server did warn me that it had “a kick” to it, but personally, I found it to be much spicier than that, so proceed with caution if you are sensitive to spicy foods). While my entree was tasty, my favorite part of the meal was dessert: a gluten-free Pineapple Upside-Down Cake topped with a delicious cream. Postcards is a favorite on the island, so it’s worth stopping by for an exceptional dinner. 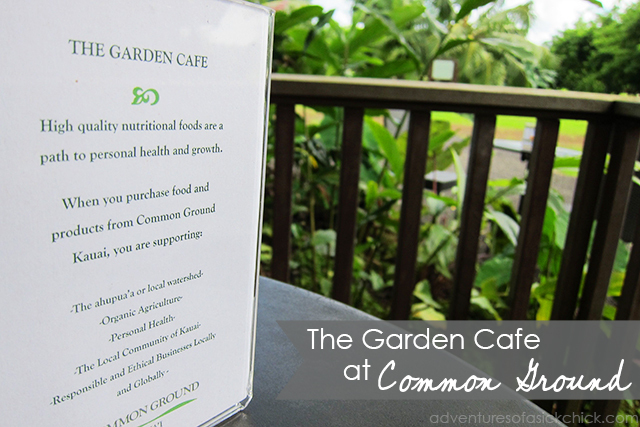 The Garden Cafe at Common Ground (Kilauea, North Shore) – we enjoyed breakfast here one morning on our way to walk the Wai Koa Loop Trail and visit the Stone Dam. Located at Common Ground — a local farm featuring “beautiful edible landscapes and lush tropical gardens” — The Garden Cafe serves “fresh, organic field-to-table” food, including several gluten-free options (in most cases, just ask them to leave out the toast or tortilla portions). I was so tempted to try their gluten-free Acai pancakes, but I stuck with a more protein-based meal to make sure I wouldn’t run out of energy or suffer any digestive distress that day. Part of me wishes I just went for it, though! The menu features tasty options for breakfast and lunch while providing the comfort that everything is organic, non-GMO and sourced from locally grown, sustainable agriculture. 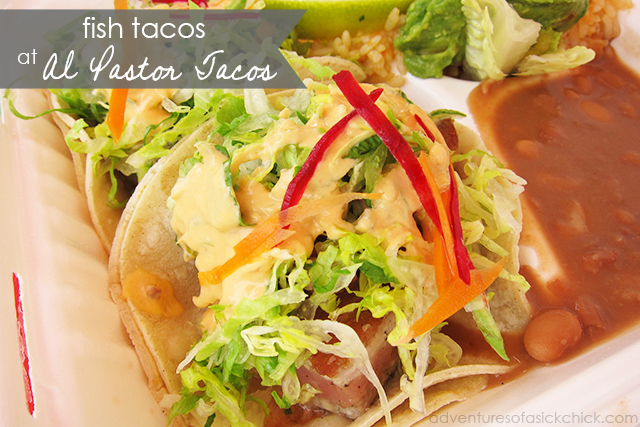 Al Pastor Tacos (Kapaa, East Shore) – we randomly stumbled upon this food truck while driving through the charming coastal town of Kapaa and our luck couldn’t have been better. Located on the Kuhio Highway across the street from the Kauai Products Fair (a small swap meet with fun souvenirs), we couldn’t resist trying what turned out to be our favorite meal from the trip…and yes, it came from a food truck! We both ordered the fish tacos and they were fresh and delicious. Jeremy had his fish prepared the way they recommend — medium rare — but I asked for mine fully cooked because of my health issues. Either way, we both raved about our meals and wish we had discovered Al Pastor earlier during our trip. It was THE BEST — and ironically, the least expensive — meal we had on the island. (Note: I verified that the fish tacos I ordered were gluten-free, but be sure to ask about whatever you order because this menu does not automatically identify gluten-free items. Also, I’m not sure if they take measures to avoid cross-contamination, so Celiac folk should investigate further.) On top if it all, their customer service is excellent and their disposable containers are non-styrofoam, yet another example of sustainability on Kauai. Trust me: you want to stop here! Duke’s Kauai (Lihue, at the Marriott) – we ended up at Duke’s on the spur of the moment, as we were looking for a place to have dinner that was close to the airport, and they accommodated a last-minute reservation for us. Although they don’t offer a specific gluten-free menu, I simply asked our server for gluten-free suggestions and she was very well-informed and helpful in assisting me with choosing an entree. I ended up with a very tasty baked monchong (fish) dish with grilled asparagus on the side. It did not disappoint! They also have a nice salad bar which automatically comes with each entree, and since they are located on the beach, we had a lovely view. Nanea Restaurant and Bar (Princeville, North Shore, at the Westin) – this was the restaurant located in the hotel where we stayed, and I was pleased to find that they have a designated gluten-free menu and are happy to accommodate special requests. This made it very convenient to eat gluten-free without having to go very far! We enjoyed dinner there one night, where I had grilled ono (the catch of the day) with green beans and garlic mashed potatoes (since potatoes are starchy, I couldn’t eat too much of them, but it was challenging because they were goooood). We also partook in their Sunday brunch where I had a yummy veggie omelette and other gluten-free bites from the buffet. Nalu Kai Grill and Bar (Princeville, North Shore, at the St. Regis) – this beachside/poolside restaurant at the St. Regis offers both service on the beach and also a sit-down option at the actual restaurant. During the time we spent at the St. Regis beach, I enjoyed several munchies, including the Chilled Local Kobocha Soup, the Tomato and Mozzarella Salad and a burger on a gluten-free bun (note: you’ll need to request the gluten-free bun as it’s not actually listed on the menu). And although we didn’t get to try them, the other fine dining restaurants at the St. Regis also have gluten-free menus and are accommodating to their gluten-free guests. Aside from all the local eateries on the island, there are also many healthy options for cooking or grilling yourself (if you have that option at your hotel), or for simply picking up some healthy snacks to have on-hand. There are different farmers markets almost every day on the island, along with several natural food markets where you can pick up organic food options. We visited both Papaya’s Natural Food Market in Kapaa (sort of a very scaled down version of Whole Foods) and Harvest Market in Hanalei. Even the Foodland in Princeville (a supermarket chain) had a decent organic section and alternative eating options. Although the smaller markets are on the expensive side, if you are picking up just a few key items, it’s totally worth it in my opinion. As much as we enjoyed indulging at the restaurants on Kauai, some of our other favorite meals were the ones we made ourselves back at our hotel. We were fortunate to be able to upgrade to a room with a full kitchen, which is always a plus for me because I love the option of being able to cook. I especially love making breakfast, so most mornings consisted of an organic veggie egg scramble with fresh fruit and organic tea sweetened with a touch of raw honey. Not only did this give us the chance to enjoy our lanai and our beautiful view of the ocean, but I was able to make breakfast just the way I like it (I’m sometimes a bit particular), and it was a lot less expensive than eating out every morning (which meant saving a little cash that we could use to splurge at dinnertime!). In addition to our morning feasts, we also had the pleasure of grilling one night (on one of the many barbecue grills that the Westin provides), and this turned out to be our other favorite meal of the trip: a grass-fed rib eye steak (picked up at Harvest Market), along with beautiful collard greens and baby carrots (picked up at one of the island’s many farmers markets) sautéed with fresh garlic and coconut oil. 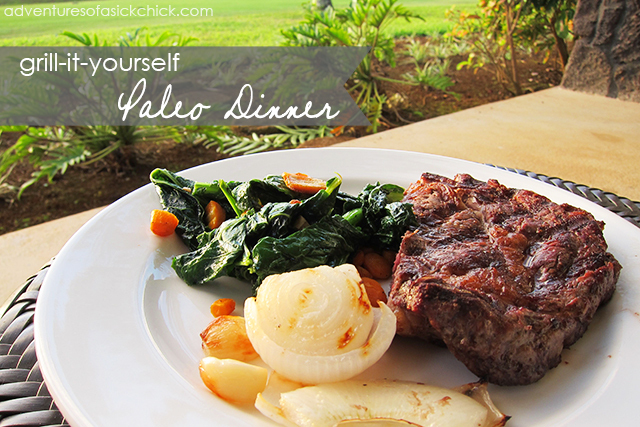 Seasoned to perfection and starch-free, this dinner treat was not only gluten-free; it was also Paleo, delicious as could be, and left us free of that heavy feeling that often comes with a carb-heavy meal. Having the option to cook at our hotel also was beneficial because in addition to my gluten sensitivity, I have some vegetable restrictions due to my Crohn’s condition and surgical history. Despite the availability of fresh veggies on the island, many of the side offerings in restaurants are raw salads, and after two intestinal surgeries, I’m unable to digest most raw veggies, especially leafy greens (even some cooked veggies are an issue). I never want to experience another blockage (one of the worst longterm post-surgery side effects), so salads are not an option for me. Having the choice to cook at our hotel allowed me to incorporate more cooked veggies into my diet and have better control over what I ate during our stay. This is key for anyone who’s health relies on proper food choices. So if you are gluten-free, Paleo, vegan, or dairy-free (or a combination of), you will not be short of options on the island of Kauai. And there are still so many places that we didn’t have the chance to try (obviously, we didn’t get to explore the culinary options in Poipu, Koloa and on the South Shore)! So please share…what are some of your favorite places to eat on Kauai? I found Maui and the Big Island to be the same way, super gluten-free friendly! I also had a hard time resisting the gluten-free bread offered at most restaurants, but I try not to worry too much about indulgences too much as long as I’m still feeling good. The next time I visit Hawaii I want to go to Kauai and I will definitely be referring to this post! Kauai sounds amazing! Thanks, Brittany! I agree – we recently visited Maui, and I found it to be pretty gluten-free friendly. Not quite as much as Kauai, but still pretty good. I have yet to visit the Big Island, but it’s good to know they are also GF friendly. Thanks for your feedback!